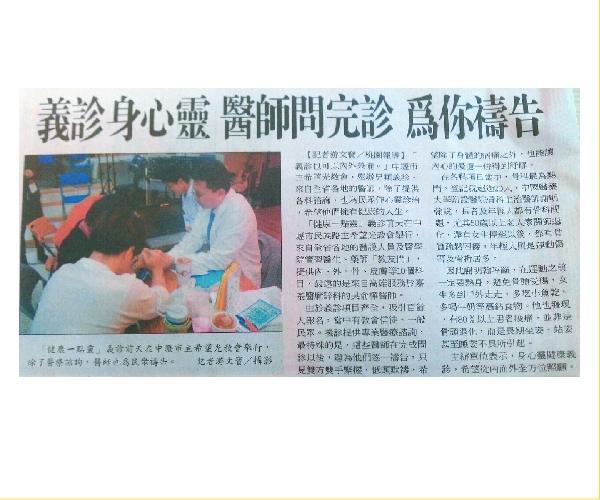 Recently, Christian Gospel Mission's Lord's Light of Hope Church in Zhongli held free medical consultations. On top of consultations for various diseases, psychotherapy was also provided so that depression of the heart, as well as physical pains, may be treated. Held in the church located on Minzu Road in Zhongli, this event gathered medical staff, intern doctors and pharmacists who belong to churches from all over Taiwan. Attracting hundreds of people to the event, this medical consultation was unique because the doctors would pray for the patients after the medical consultation. The church expressed that, “The root of illness is commonly in our innermost being.” In the process of therapy, people were advised to change their thoughts, habits and customs in order to gain unimaginable positive effects. Many patients realized profoundly after hearing this advice and praised this special psychotherapy session. Yang, a citizen, said that it is possible for inner thoughts to influence external illnesses and that he would share this experience with his family when he returned home. The Lord`s Hope of Light Church expressed that orthopedics was the most popular department; it attracted more than twenty people. Ming-han Hsieh, the Visiting Staff Physician of Orthopedics in China Medical University Hospital, attended the consultation the day before and said that people have orthopedic problems regardless of age. He also advised the public to eat more calcium-rich foods such as dried fish and milk.